“Extravagant”, is the term used by a spokesperson for the Moroccan government, to describe the request made by several MEPs to exclude Western Saharan waters from the EU-Moroccan fisheries agreement. 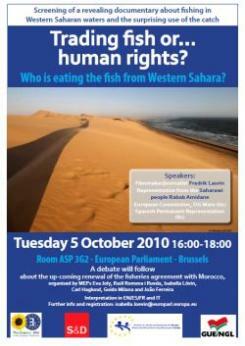 MEPs from different political groups launched this request during a seminar on illegal fisheries in Western Sahara, held in the European Parliament on Tuesday 5 October. “The request is extravagant, as it is has no legal basis”, said Moroccan Minister for Communication and spokesperson for the Moroccan government Khalid Naciri, in a press conference yesterday. On Tuesday, a group of MEPs from different political groups had called for the exclusion of Saharan waters from the EU fisheries agreement with Morocco. The agreement will terminate in March 2011. MEPs Raul Romeva, Eva Joly, Isabella Lövin, Guido Milana, Carl Haglund and João Ferreira stated that the agreement should not be renewed if it includes the waters adjacent to Western Sahara, as is currently the case. EU fisheries alongside the territory of Western Sahara are considered illegal, since they do not take into account the wishes and interests of the Saharawi people – as required under international law. Western Sahara is not considered part of Morocco by the international community, and Morocco's claims to the territory have been rejected by the International Court of Justice. However, that does not stop foreign companies and governments to do business in the territory, via contracts with the Moroccan authorities. The EU is in the forefront in the business in the occupied territory, through its fisheries agreement. During the seminar in the European parliament, titled "Trading Fish or Human Rights", a documentary was presented on the use of fish caught in Western Saharan waters for the production of fish oil in Norway and Sweden. Yet this million dollar business does not benefit the Saharawi, as was explained by Saharawi activist Rabab Amidane, who currently resides in Sweden under political asylum. The MEPs emphasized the link between fishing and respect for human rights and stressed that the current fisheries agreement with Morocco is not benefiting the Saharawi people, although the EU fleet is operating alongside their coasts. “Morocco has sovereignty and jurisdiction over that territory. There is but one law applicable over the territory and its waters, and that is the Moroccan law”, Khalid Naciri said. “However, Morocco will not forbid certain people to have other fantasies”. According to Spanish News Service Efe, Naciri mentioned nothing on the information the European Commission had requested on the impact of the current fisheries agreement on the population in the disputed territory. The Commission has indicated on multiple occasions that such information is a necessary condition for extending the fisheries agreement. Yet, since the initial request was made in February this year, the Commission has not received anything from Morocco.